SlimFast Reviews - Can It Help You Lose Weight? SlimFast is a meal replacement system based on shakes, smoothies, and low-calorie snacks. The idea is that eating SlimFast shakes or baked goods instead of two of your meals will help you lose weight. SlimFast Review: Can It Help You Lose Weight? SlimFast is a meal-replacement system and brand of low-calorie snacks and shakes that are designed to help you lose weight by limiting the number of calories you eat in a day. The company website states that the idea behind the SlimFast Plan is that eating SlimFast products will curb your appetite and keep blood glucose levels from dipping between meals so that you stay full. According to the company website, the SlimFast plan is best for people who need to lose about 20 pounds or roughly ten percent of their body weight. Women are expected to eat 1,200 calories per day, while men are allotted 1,600. To follow the traditional plan, you need to replace two meals a day with a SlimFast shake, cookie, or bar and eat a third 600-calorie meal from standard food. You can supplement your diet with three 100-calorie snacks like a piece of fruit or something from the SlimFast line of chips and crisps as well. Fruit juice and soda are not allowed on the SlimFast diet. The company website also recommends adding 30 minutes of exercise to your daily routine to burn more calories and improve your health. By following the plan’s calorie regimen, the site states, most people can expect the process to take around eight to ten weeks. After weight loss is achieved, it’s recommended that dieters continue to use SlimFast products to make maintenance easier. Do Low-Calorie Diets Work for Weight Loss? The SlimFast plan is based on the premise that individuals should cut roughly 500 calories from their daily diet to maintain a level of weight loss around one pound per week. According to many medical websites, moving more and eating less will lead to weight loss. Livestrong.com and Healthline.com state that it takes a deficit of 3,500 calories to lose a pound, and that everyone burns a different number of daily calories. Livestrong states that the average American woman burns between 1,600-2,400 calories daily, and the average male burns between 2,000-3000. The amount of weight you can lose in a week on a 1,200-calorie diet (the amount in the SlimFast diet) is dependent on the deficit between the calories consumed and the calories burned. However, the Harvard School of Public Health states that not all calories are created equal. Emerging science shows that weight loss might be more about the quality of calories than the quantity. Instead, the best way to eat for better health might be to choose high quality, healthy goods, while minimizing foods made with processed ingredients. Nutritionists also have mixed views on the efficacy of meal replacement products like SlimFast. Health.com contrasts two different opinions about SlimFast products; one that views the plan as an excellent way to learn healthy portion control, and another that sees the products as limiting from a nutritional standpoint. What Foods are in the SlimFast Product Line? The SlimFast product line is always changing and evolving. At the time of writing, these were the available options on the SlimFast website. SlimFast shakes are the original SlimFast product, and they are the product that most SlimFast clinical studies are based on. Designed to be a total meal replacement, each shake has 10g of protein, 5g of fiber, and 24 vitamins and minerals. Flavors include Creamy Milk Chocolate, Strawberries & Cream, Rich Chocolate Royale, Cappuccino Delight, and French Vanilla. If you prefer to make up your own shakes, the Original Shake Mix provides enough powder for 14 shakes. Filled with twice as much protein than the original shakes, the Advanced Nutrition line has 1g of sugar, 5g fiber, 1g of carbs, and 24 essential vitamins and minerals. Flavors include Creamy Chocolate, Vanilla Cream, and Strawberries & Cream. Make your own instead with the Advanced Nutrition Smoothie Mix. Providing as much caffeine as a cup of coffee, SlimFast Advanced Energy Shakes also contains 20 grams of protein, 5g of fiber, and 1g of sugar. Flavors include Rich Chocolate, Caramel Latte, Mocha Cappuccino, and Vanilla. You can mix up your own with the Advanced Energy Smoothie Mix. Designed to supplement the SlimFast plan between shakes or to take the place of a daily shake, each serving provides 10g of protein and 5g of fiber. The cookies come four to a package, and flavors include Peanut Butter Chocolate Chip and Double Chocolate Chip. Filled with 15g of protein, 5g fiber and 1g of sugar, these bars are a standalone meal replacement option that come in two flavors: Chocolatey Crispy Cookie Dough and Chocolatey Peanut Butter Pie. The SlimFast plan allows for a 100-calorie snack between each meal, and these Snack Chips qualify. Each 100-calorie serving contains 2g of protein and 5g of fiber. Offered as a 100-calorie for snacking between SlimFast meals, these crisp flavors include Cinnamon Bun Swirl Drizzled crisps, S’Mores Drizzled crisps, and Peanut Butter Chocolate snack bites. Each serving has up to 4g protein and 5g fiber. What Can We Learn from SlimFast Ingredients? SlimFast foods are prepackaged and designed to be consumed directly in the package (or mixed with water or dairy for the shake mixes), meaning that they contain many ingredients that are confusing for consumers. SlimFast products contain multiple kinds of sweeteners (sugar, fructose, Maltodextrin, Sucralose, Acesulfame, Dextrose), though the website shows that most products have just one gram per serving. Forbes told us that one of the best ways to lose fat is to remove sugar completely from your diet. Let’s look at some other interesting ingredients from this list. Canola Oil: This is a common cooking oil that Healthline states is low in nutrients, but high in trans fats and omega-6 fats. Calcium Caseinate: A milk-derived protein that Livestrong told us is used to dissolve ingredients faster, making it a standard ingredient in supplement products. Gum Arabic: The hardened sap of the Acacia tree, gum Arabic has been the focus of female BMI studies (it was shown to be effective). Cellulose Gel/Gum: Healthline shows us that cellulose is used as a thickening agent that is considered a safe food additive. Hydrogenated Soybean Oil: This oil is a form of trans fat that Mercola lists as ‘one of the most harmful ingredients in processed foods’ because of its links to diabetes, obesity, and heart disease. Soybean Lecithin: Drugs.com classifies soybean lecithin as an emulsifier for processed foods that is often added to products as a weight loss aid. However, it might have links to cancer, reproductive issues, and other health concerns. (The FDA hasn't yet determined safe levels). Isolated Soy Protein: As protein isolated from soy products, Nutrition Data states that soy protein isolate is a healthy source of protein because it is low in cholesterol and saturated fat. Potassium Phosphate: Typically used as a medication to balance the body’s calcium levels, EveryDayHealth states that potassium phosphate helps regulate kidney function and prevent kidney stones. Carrageenan: This ingredient is a seaweed-based thickener and binder. However, studies show that even small doses can cause problems to lab rats, including promoting the development of cancer cells. Artificial Flavors: This is an unregulated term used to denote manmade synthetic ingredients that are designed to mimic the taste of natural flavors. Our research couldn’t locate the source of SlimFast’s artificial ingredients. Are there Health Risks for SlimFast Products? While we couldn’t find any record of health problems caused by consuming SlimFast products, the company website state that the food is designed around the nutritional needs of people over age 18. Likewise, it’s suggested on the website that women who are pregnant or breastfeeding talk with their doctor before starting a SlimFast diet. What Do Clinical Studies Show About SlimFast? The SlimFast website states that fifty published clinical studies were designed and conducted concerning SlimFast products by independent researchers. These studies reveal, according to the website, that the SlimFast plan is scientifically proven to help you lose weight. Do these studies fit reality? The SlimFast website lists the information for fifty studies, ranging from 1990-2011. None of these studies are linked though, and we couldn’t find other information from SlimFast about what they revealed. Looking through research from the Vanderbilt University Student Psychology website, WebMD’s review of popular diets, and the SlimFast profile on U.S. News and World Report offered us some guidance about what these studies showed. One of the most recent SlimFast studies (published in BMC Public Health in 2016) looked at seven articles that compared different commercial weight-loss programs like SlimFast, Weight Watchers, and Atkins. While the results didn’t show that participants lost significantly more weight in one program than any other, they did show that SlimFast participants tended to have the lowest blood pressure, especially when compared to the Atkins diet. Likewise, a 2006 study in the British Medical Journal compared four commercial weight loss plans (SlimFast, Weight Watchers, Eat Yourself Slim and Atkins). The study found that SlimFast participants lost an average of six pounds in four weeks, which was equally effective as the other plans (though Atkins participants lost an average of ten pounds). Evidence also shows that the results from SlimFast might be long-lasting. A 2000 study in the journal Obesity Research found that overweight test subjects who followed a SlimFast diet for four years lost an average of 8.5 percent of their body weight, compared to 3.3 percent for participants placed on a low-calorie diet. However, a publication in the Annals of Internal Medicine in April 2015 highlighted a systematic review of commercial weight loss programs and concluded that SlimFast results were mixed. While some participants experienced significant weight loss, others didn’t, leading researchers to suggest that more study is needed to determine the overall effectiveness of commercial weight loss programs. How Easy is the SlimFast Diet to Follow? Whether or not you find the SlimFast diet easy to follow depends on if you like the brand’s products. Customer reviews from online suppliers like Walmart vary considerably on whether people like the taste of the bars and shakes, but we found that reviewers consistently praised how convenient SlimFast products are and how freeing they found it to still maintain control over one meal each day. To help dieters make better food decisions, SlimFast provides hundreds of recipes for 500-calorie meals that dieters can eat for their ‘normal meal’ each day, which might help some dieters make the switch to healthy eating a permanent part of their lives. The website also offers advice for eating out, like asking for salad dressing on the side. While the SlimFast diet recommends eliminating alcohol, it does allow for the occasional drink, preferably a glass of wine or a shot of liquor, rather than a sugary drink like a margarita. What Do Customer Reviews Say About SlimFast? At the time of writing, there were about sixty reviews for SlimFast on their Consumer Affairs listing, averaging two out of five stars. Most negative reviews mention not liking the taste of the shakes, a lack of customer support, and increasingly higher prices for the products. Reviews on the overall taste of SlimFast products are mixed. Many customers lament the loss of the original formula, claiming that the new shakes have a watery, gritty taste instead. We found that the 100-calorie chips and snack packs tend to get high praise. Many customers mention that they appreciate how convenient it is to incorporate SlimFast products into a morning routine. Others found that the limited product line became boring quickly, making it hard for them to stick with the plan. Where Can You Buy SlimFast Products? SlimFast products are sold in a variety of grocery stores like Walmart and Target, as well as Amazon. There aren’t any official prices set by the manufacturer, but an eight-pack of premade 11oz SlimFast shakes retails for about $10, which is about the same cost of 11oz of smoothie powder (which makes 14 servings). A five-pack of 100 calorie snacks retails for about $6.50, and an eight-pack of meal replacement bars or cookies retails for about $14. If you need to contact the company for any reason, their phone number is (800) 754-6327. 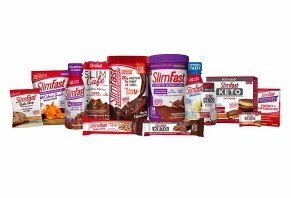 Since SlimFast products first entered the market in 1977, the demand for meal replacement products has exploded, providing plenty of options to compare to SlimFast foods today. To make a meaningful comparison, we chose to look at Atkins High Protein Shakes and Orgain organic Shakes. The Atkins Shakes come in a variety of flavors and cost about $6 for a four-pack. Each shake is designed to be a complete meal (like SlimFast shakes), and they also come with one gram of sugar and three grams of ‘net Atkin carbs.’ The shakes also contain 15 grams of protein (compared to 10 grams for SlimFast shakes), or about 38 percent of the daily value for the average individual. While their higher protein content might leave you feeling fuller than sipping a SlimFast shake, a common complaint we noticed about the Atkins shakes on Amazon was that they weren’t very filling. Also on Amazon, the shakes sell for about $6 per four-pack. For those who prefer a simpler ingredients list, Orgain Nutritional Shakes provide an alternative. These 260 calorie protein shakes are made from all organic ingredients, and they total 260 calories each (twice the amount in Atkins shakes, and about 50 more than in SlimFast shakes). Each serving contains 16 grams of protein from organic grass-fed milk, and a four-pack retails on the website for about $14. Our View: Will SlimFast Help You Lose Weight? Though we haven’t tried this meal plan for ourselves, the available nutritional research and decades of clinical studies reveal that the SlimFast meal replacement plan might be a viable way to lose weight and keep it off. Research from the previously mentioned clinical studies and health websites shows from low-calorie diets can work for long-term weight loss without harmful side effects. SlimFast products have been tested in many studies, and the results show that they work as a weight loss strategy for many participants. Our research into customer reviews and the company website shows that the SlimFast plan might work best for people who have about twenty pounds to lose, need lots of structure in their diet, and appreciate the convenience of ready-made meals. However, the meal plan’s reliance on processed food and possibly unhealthy artificial ingredients goes against the philosophy of healthy, whole foods that Harvard School of Public Health recommends. It also might prove challenging to stick with the plan for longterm weight loss if you tire of the SlimFast product line. If you are considering starting a low-calorie diet to lose weight, it’s always best to talk with your doctor before beginning. Only a nutritional expert can give you advice about whether the SlimFast plan makes sense for your situation. Write a Review for SlimFast!